Mar. 4, 2015 1:00 p.m. 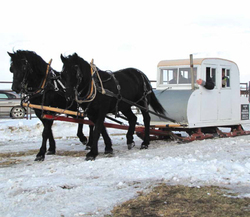 This year the weather was perfect for the 17th Wetaskiwin Cutter Rally, which made it most enjoyable for the horses, drivers, passengers, and spectators. There were 18 entries this year, with six of them first time entries here. Some of the entries have been at every Wetaskiwin Cutter Rally. Rigs came from Rimbey, Ponoka, Mulhurst Bay, Bentley, Millet, and Maskwacis, as well as from the Wetaskiwin area. As usual, the tables were nearly full for the chili, hamburgers and donuts lunch afterwards. After lunch, the draws had a new feature. Following the 50-50 draw, the same tickets were used to draw for gift cards donated by Wetaskiwin Nut & Bolt, Smitty’s Family Restaurant, or Huckleberry’s Cafe. A draw of entry numbers determined the order in which the drivers could select their preferred bucket of horse related items. As well as the above, sponsors for the 17th Cutter Rally were: Wetaskiwin Co-op, Henry Helfrich, Dart Electric, Signs & Graphics By Foss, Jack Armstrong, Tim Hortons, Peavey Mart, Circle Seven Transport, B P Plywood, Jim Wilson, Alfred Tauber, Jim Gordon, Cecil Rehaume, and Ed and Dianne Bruebaker. The first Cutter Rally at Wetaskiwin was held in 1999. After Charlie Foster had been to a few rallies, he thought it would be a good idea to hold them here, too. A member of the Wheels and Runners Club, he had support for the idea and was able to arrange with the Ag Society to use their facilities. By the time everything was in place, it was late in the season, and Foster himself used wheels on his outfit for that first small rally here. From the beginning, the Co-op has supported the rallies. For the first rally, Jim Samborsky from the Co-op Cafe provided a pot of chili free. The second year, the rally became an Ag. Society event, and has been since. For several years, Charlie Foster led the pack over zig zag trails that let the drivers look around and see the whole procession. Since then, numbers have been up and down, with the most entries at a rally being 36 rigs. A number of the older drivers have dropped out or passed away, and there is a lack of younger drivers coming up, although there were some new young drivers this year. The Cutter Rally season starts after Christmas, with rallies held in eight or more locations some years, although some communities have dropped their rallies recently. The Cutter Rallies provide a unique opportunity for those interested and/or equipped for this aspect of horsemanship to gather, share information, socialize, and maintain knowledge of a traditions. Pictured: Allen Winehandle has the kind of caboose that was used to give children a warm ride to school in the good old days of the one room schoolhouse. Photo by Margaret Chegwin. See another event photo in this week’s paper.